Mold is everywhere. In nature, mold and other fungi have a vital role. They help dead matter decompose. Mold also helps make medicine, bread and beer. Some species of mold are harmless, but in a home, mold can be toxic. Black mold (Stachybotrys chartarum) and another toxic mold, Aspergillus. Dark brown mold in the bathroom is Cladosporium, a less toxic variety. Mildew, a separate type of fungus, is pale grey or whitish in color. Mold releases spores. Some spores produce mycotoxins, or toxic compounds. Mycotoxins on mold spores have been linked to serious health problems and disease. Reactions can be mild or severe, and range from mild sniffling to sore throat, itchy skin and eyes, asthmatic reactions, and bowel or respiratory disease. Like all living things, mold needs humidity, food and oxygen to survive. Look for groups of small dark spots on walls, ceilings or floors, especially in corners and nooks. Mold loves the dark, moist conditions behind pictures and draperies, under windowsills, in books and in tile grout. Look in basements, crawl-spaces, and bathrooms. Test structural wood by pressing firmly. If wood is tender, it’s rotting, and mold is at work. A musty odor, especially in humid conditions, is a sure sign of mold in the house. Mold test kits can identify the amount and types of mold present, based on spore count. It’s not necessary to identify the type of mold in order to kill it. All species respond to the same treatment. For spot cleaning, a mild detergent will work. Use a sponge or scrubber, and thoroughly wash and dry the surface. For roofs and rough surfaces, use a stiff brush. Chlorine bleach kills mold. Clean and disinfect surfaces with half bleach, half water. If using acidic cleaners, or for large moldy areas, wear protective gloves, goggles and a filter mask (N-95 or higher) or respirator. Never mix bleach with ammonia or any other household cleaner! They could make a poisonous gas. Detergent and bleach will remove mold from a surface, but often the problem goes deeper. By the time a few spots appear on a wall, mold may be rampant on the other side. Find the source(s) of mold. Check under carpet, floors and roofs. Inspect wallpaper and ceiling tiles. Rip out and throw away damp or moldy materials such as insulation or drywall. Wear protective gear when handling moldy items. Clean and disinfect all surfaces with bleach. If cleaning up after a flood, dry everything within forty-eight hours. Toxic mold can grow within a day, so put rugs backside up in sunshine, and open doors and windows if possible. Use blowers to circulate air. Dehumidifiers can also help. Clean and sanitize carpets with a deep carpet extractor or professional steam cleaner. Vacuum with a high-efficiency particulate air (HEPA) vacuum. The HEPA filtration is smaller and will trap mold spores. Seal the vacuum contents in plastic bags, and discard as normal waste. If mold is stubborn or widespread, get professional help. Professional mold remediation is expensive, so check references and credentials. Compare and contrast service and price. Most companies offer a free consultation and estimate. Without humidity, no mold can grow. Fix leaks around tubs, roof or pipes. Even a small leak provides a perfect habitat for mold. Invest in a Dehumidifier. The Centers for Disease Prevention and Control suggests a humidity level of 45% or less. Avoid over watering houseplants. Mold can grow in soil, or damp areas around plants. Install bathroom and ceiling fans. Let air circulate through the house. Clean air ducts and other dust-trappers. 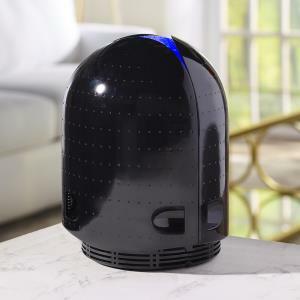 The Environmental Protection Agency recommends an Air Purifier with a HEPA filter, to trap airborne mold spores. If possible, landscape so that water drains away from the house. Check thoroughly for mold, on a regular basis. Mold can be useful in nature, but has no place in the home. Proper cleanup and precautions will get rid of toxic mold, and prevent it from coming back.